Case A: The CEO has done a good job for a long period of time. However, the organization has moved sideways for years in an environment that calls for service growth with modest risk. A series of weak board chairs have had responsibility for CEO evaluations. The CEO assumes many board responsibilities by skillfully fostering board consensus based on his modest accomplishments. Inconsequential items populate agendas, and a fast rotating executive committee is enamored with the CEO. A review of the minutes revealed that there hasn’t been a dissenting “no” vote cast for decades. Case B:The CEO, who had attended a major university’s nonprofit seminar, is regarded by the board as the sole information source on changing governance and management styles. But she/h has allowed the CFO to continually postpone the submission of an accounts receivable report for nine months. When finally submitted, it became clear that the CFO has been carrying many non-collectable accounts as assets. As a result, the nonprofit had to restate financial statements, requiring the assistance of high-paid forensic accountants. Stakeholders became concerned about the viability of the organization. Both the CEO & CFO lost their positions. What Can Be Done To Prevent Management From Overriding the Board? But if a constant struggle persists between the two groups, the organization will evolve to one in which the board abdicates its policy-strategy responsibilities to management and/or the board will want to micromanage operations as a way of consolidating power. Neither is a healthy way to operate in the 21st century. 1. are willing to develop off-line communications channels with others on the board, especially when important issues are being discussed. This assumes the board isn’t a governmental one that can restrict this practice. 2. can articulate complex issues clearly to their peers. 3. are willing to attend social and staff events to become better acquainted with peers and staff. In most nonprofits, the board is only several organizational levels away from the staff. 4. are curious and willing to gather information from other sources than management. They feel they are in a position of strength and are willing to call for the board to engage its own legal counsel if a dire situation arises. 5. have their egos in place and can quickly realize what they don’t know and move quickly to fill the gap. 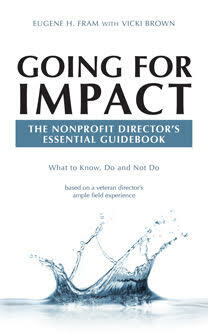 Nonprofit directors will never have the breadth or depth of information possessed by management. To be effective in the 21st century, they will need to trust but verify in their governing overview responsibility and to proactively seek information from atypical sources, such as employees below the management level.